Eberhard & Co. is a brand steeped in precision Swiss watchmaking excellence since 1887. 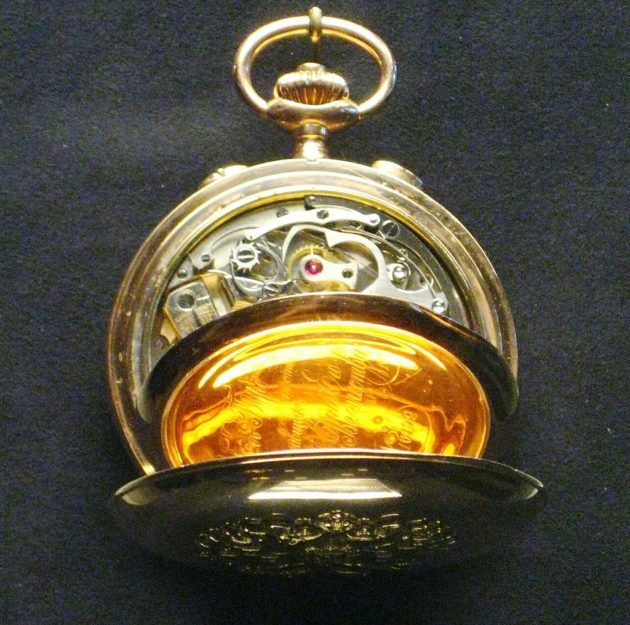 Founded by watchmaker Georges Eberhard in Le Chaux-de-Fonds Switzerland, the brand was first noted for its innovative pocket watches, featuring a patented time-setting system, as well as hours and minutes reading system. In 1938, Eberhard & Co. introduced the first chronograph watch with an hours counter. The brand followed with the 1959 introduction of the first split-second chronograph, the Extra-Fort Chronograph. The Eberhard & Co. 8-Jours Watch was the first mechanical timepiece with an 8-day power reserve, providing the wearer with the convenience of not having to manually wind the watch for eight full days. However, Eberhard revolutionized the watch industry in 2001 with the introduction of the Chrono 4 timepiece, the first and only chronograph with its counters arranged in one single horizontal row. 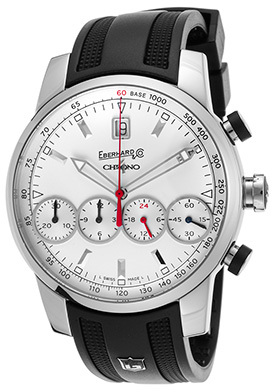 In 2005 Eberhard & CO introduced an updated Chrono 4 model with the counters arranged in a vertical row. You’ll find the Eberhard & Co. Chrono 4 and other popular styles this week at WorldofWatches.com at savings over 69% or more off the suggested Manufacturer’s suggested retail prices. The Eberhard & Co. Chrono 4 Grande Taille Automatic Chronograph available with both a black and silvery-white colored dial is an outstanding choice. Virile and masculine, this exemplary Swiss-made men’s timepiece features the premium grade stainless steel case, highly polished to a mirror-bright glow. The high-performance black rubber strap with textured detail insets has a deployment clasp for added convenience and security. Decorative black rubber trim on the side push-pieces adds distinction. The stationary bezel frames the dial with the signature four patented sub-dials, a tachymeter outer dial, luminous skeleton hands and hour markers. Features include an automatic date window below the 12 o’clock hour, small-second, 30-minute, 12-hour and 24-hour counters. Features include a scratch resistant sapphire crystal above the dial and water-resistance to 50 meters or 165 feet. Eberhard & Co. Chrono 4 Grande Taille Automatic Chronograph is 43mm in diameter and 14mm thick. 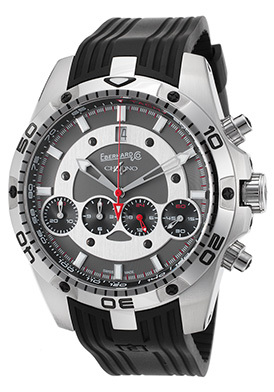 The Eberhard & Co. Chrono 4 Geant Automatic Chronograph is an outstanding diver’s watch selection. This robust men’s watch is bold and rugged with a robust premium grade stainless steel case in a lustrous polished finish, presented on a high-performance black rubber strap with grooved detail and a convenient deployment clasp closure. The stainless steel unidirectional rotating bezel with engraved markers surrounds the charcoal gray dial with four single row sub-dials, skeleton luminous hands and hour markers. A window below the 12 o’clock hour reveals the automatic date calendar. Features include small-second, 30-minute, 12-hour and 24-hour counter registers. 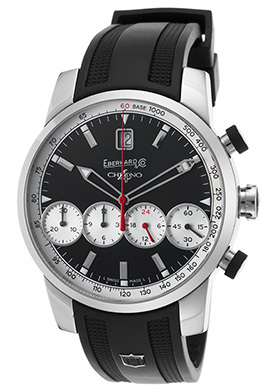 Eberhard & Co. Chrono 4 Geant Automatic men’s chronograph is 46mm in diameter and 14mm thick. Additional features include a glare-proof scratch resistant sapphire crystal above the dial, along with a locking screw-down crown and case back for water-resistance to 200 meters or 660 feet. 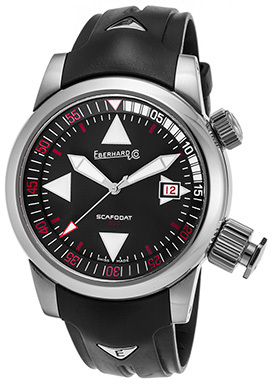 The Eberhard & Co. Scafograf 500 is the quintessential diver’s watch choice. This outstanding Swiss-made automatic men’s watch features the amply proportioned stainless steel case in a polished finish, presented on the ultra-durable black rubber strap with a buckle clasp closure. The integrated stationary bezel surrounds the highly legible black dial with luminous hands and hour markers. The slide-rule rotating outer dial records dive times by the operation of the second, locking screw-down crown at the 4 o’clock hour. A glare-proof sapphire crystal covers the dial. The locking screw-down crown and case back provides water-resistance to 500 meters or 1,650 feet. Eberhard & Co. Scafograf 500 men’s watch is 44mm in diameter and 15mm thick. Vintage pocket watch image courtesy of Wiki Commons.